Track-O Cross-Country Utility - Movex Innovation Inc. 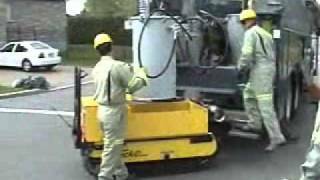 The Track-O Cross-Country Utility is an equipment specially designed for the requirements of the electrical distribution industry. This model makes it possible to transport transformers too hard to access places and install and/or replace them with the winch. This tool is very safe and very stable, making it possible to move transformers weighing nearly 2000 lbs. The Cross-Country Utility has a runtime of 4 hours and makes no noise. It can cross obstacles such as ravines, water, snow, mud. It is equipped with a box to hold tools, such as a lamp, drill, or any small tool needed by lineworkers.